Nero Tiger granite is quarried in India. It has a dark beige background with various reflective minerals embedded in the stone. Since each slab is unique, the minerals can be found in large or small amounts of gold, yellow, brown, and gray colors. Nero Tiger granite gets its name because it also contains continuous black granite waves with lots of movement similar to the skin tone of a tiger. 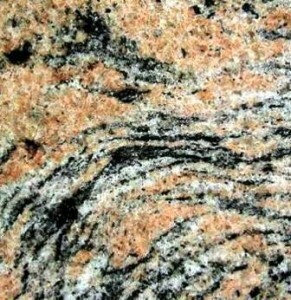 This granite can be very versatile depending on your current kitchen and bathroom decor choices. Nero Tiger can give a room an exotic feel, but in other rooms with different lighting and décor, it has an understated refined aura. Keep in mind that the more natural light you have in a room, the various often hidden colors in the granite are exposed. This trendy and exotic granite looks amazing with dark brown cabinets or bathroom vanities.